"The seamless excellence provided from start to finish made your job look a lot easier than it was, especially with the tsunami of last minute changes." The aesthetic of a Mercedes Sprinter fleet arriving at an event or wedding is unparrelled. 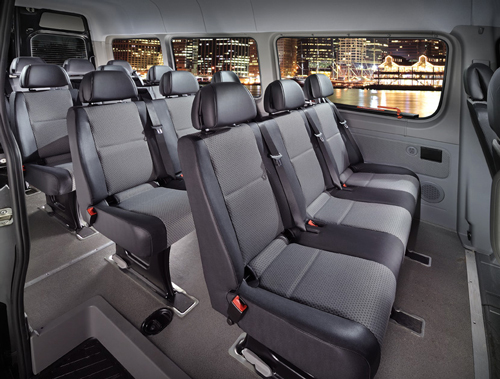 Each standard Sprinter Van holds up to 14 passengers in rows of seats. Similar to our custom Mercedes Sprinter Van you still have the same 6'3'' standing headroom clearance. You can use an unlimited amount of these vehicles making this the go-to option for the biggest and most luxurious weddings in NYC and LA. Brilliant's chauffeured luxury van service with customized Mercedes Sprinters create an unforgettable experience. The 14 Passenger Sprinter Van provides a sleek and stylish aesthetic suitable for any event.